Kelp (Ascophyllum Nodosum) other names: Algue Brune, Brown Algae, Brown Seaweed, Hai Dai, Kelp, Kombu, Kun Bu, Laminaire, Laminaire Digitée, Laminaire Japonaise, Laminaria digitata, Laminaria japonica, Laminariae stipites, Limu, Makombu Thallus, Sea Girdles, Seagirdle Thallus, Thallus Laminariae. 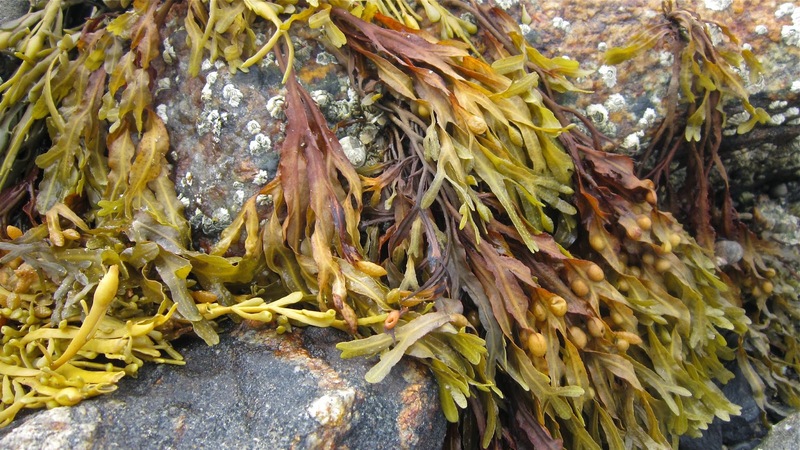 Ascophyllum nodosum, more commonly known as kelp, is actually brown-hued seaweed that is related to the Fucus family. This oceanic weed takes the shape of a solitary bladder that at its center has elongated fronds akin to straps. These fronds suspend in a descending manner, lightly wrapping the inter-tidal rocks. Some fronds of kelp also grow from either basal holdfast and generally this seaweed redevelops fresh fronds from its foot when any of its relatively larger fronds is harmed. This is done to make the stands continue to be persistent on the shore. The oceanic weed reproduces during spring in striking yellow hued receptacles. The receptacles grow in reaction to short days during autumn, become mature in winter and are known to be the most productive during spring. The eggs as well as sperms are discharged into the sea water. Soon the eggs discharge a sperm attractant called Finnavarene, which is a low weight molecule, and derives its name from the Irish village Finavarra, which means ‘wood beside the sea’. 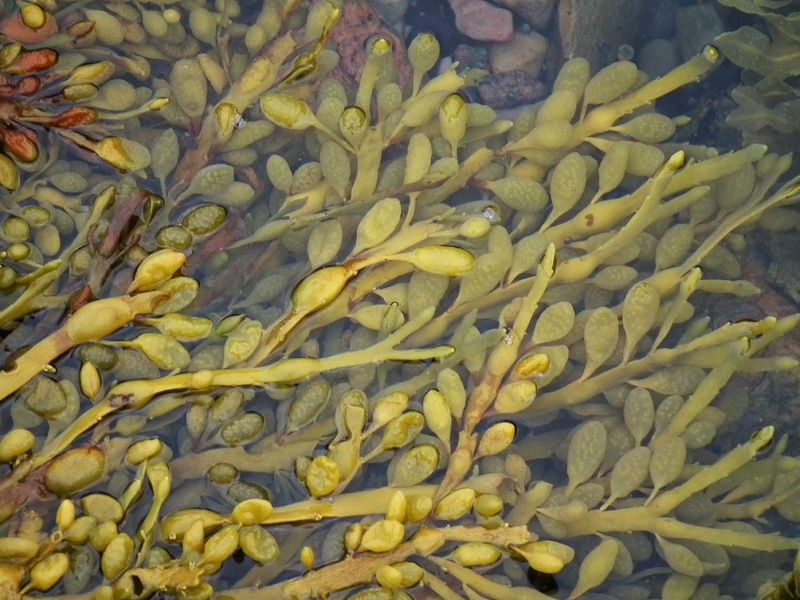 This species of seaweed possesses elongated fronds having big air bladders in the shape of eggs and they are placed in sequence at regular spaces inside the fronds and are not like stalks. Each frond can grow up to a length of about two meters and it is bound by a holdfast to the rocks as well as boulders. These fronds have an olive-brown hue and are slightly compacted, but do not have a mid-rib. Kelp is found growing in a variety of habitats along the coasts, ranging from protected estuaries to more or less exposed coasts. On the other hand, this species is seldom found on shores that are exposed and in case they are ever found in exposed shores, generally the fronds are small and severely scratched. It may be noted that the growth of this variety of seaweed is extremely slow - it just grows by 0.5 per cent in a day, but it may live long - as many as 10 to 15 years! Characteristically, the distribution of kelp may partly cover other species like Fucus serratus and Fucus vesiculosus. 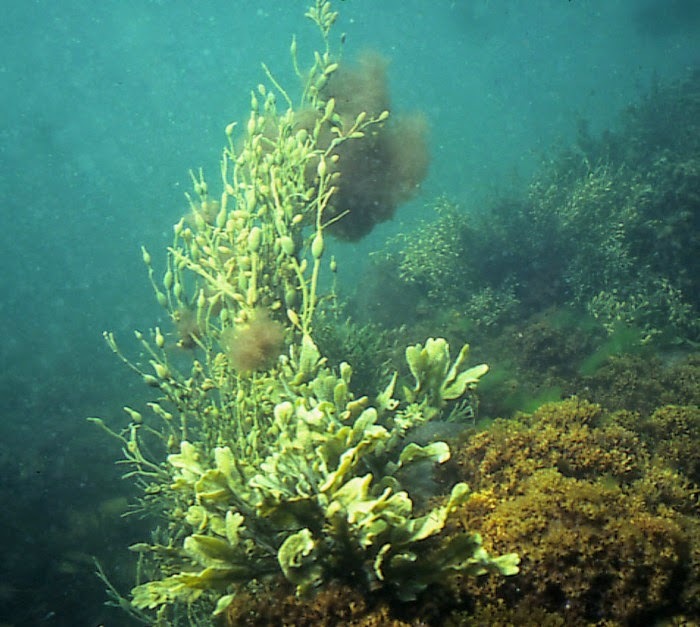 In fact, the distribution of this seaweed is restricted by a number of things, such as salinity of the water, temperature, exposure to waves, overall stress and desiccation. On average, this seaweed may roughly take as many as five years before it becomes capable of reproduction. In a number of areas, kelp is also found growing in semi-sheltered shores, inhabiting the littoral zone, which becomes exposed where there is low tide, but remain inundated when at times of high tide. The seaweed ascophyllum nodosum is a member of the Fucaceae family and it is found growing extensively in the northern part of the shores of the Atlantic Ocean, ranging from America to Europe. In addition to being used for preparing therapeutic supplements, this seaweed is extensively used in the form of foods for humans as well as animals. Moreover, kelp is also employed to make agricultural products. Kelp is used for weight loss, high blood pressure, as a bulk laxative for constipation, and for treating radiation sickness. Kelp is also used for preventing cancer. It is important to note that people who dislike or keep away from sea foods are susceptible to developing deficiency of iodine. In turn, deficiency of iodine may result in hypothyroidism (a condition wherein the thyroid glands function poorly), goiter and other health conditions. It is worth mentioning here that kelp possesses phenolic elements and as a result it has antioxidant, α-amylase and α-glucosidase inhibiting activities. Hence, it is natural that kelp is expected to provide us with various health benefits. Consumption of kelp is likely to be beneficial for people who have been struggling with the health condition called fibrous breast tissue and even pain and swelling inside their mouth owing to chemotherapy as well as ulcers in the foot (people suffering from diabetes). As a result, kelp is used in the form of supplements and it is available commercially as tablets, capsules as well as powders. The Ascophyllum nodosum species (kelp) is likely to offer a number of health benefits against specific infections. However, the studies in this regard are in a preliminary stage and further researches are required to establish this particular claim. The responses of glucose as well as insulin were the same in the case of men as well as women. And importantly, consuming the combination of kelp and Fucus vesiculosus (brown seaweed) capsules did not have any relation whatsoever with the negative side effects. The data obtained from the study hint at the fact that consumption of brown seaweed may possibly change the insulin homeostasis in reaction to ingestion of carbohydrate. In this way, kelp may possibly be beneficial for people who are susceptible to diabetes. Nevertheless, experts are of the view that further researches are required to ascertain the beneficial effects of kelp in this regard. Kelp may possibly also be beneficial for people who are struggling to lose some additional body weight. In addition, kelp may also be useful for people who have elevated levels of triglycerides. It has already been established that consuming seaweed isolates, for instance, alginate, is effective in lessening the intake of energy and, at the same time, to adjust choleserolaemic as well as glycaemic responses. Kelp is mainly harvested for its use in fertilizers, alginates (a salt or ether of alginic acid) as well as for manufacturing seaweed foods for consumption by humans as well as animals. Since long this seaweed species has been utilized in the form of an organic as well as a typical fertilizer for growing various crops, as it not only contains macronutrients like calcium, phosphorous, nitrogen, sulphur, magnesium and potassium, but also encloses micronutrients, such as copper, manganese, zinc, iron and others. In addition, kelp also acts as a host for auxin-like gibberellins, cytokinins, mannitol, betaines, polysaccharides, organic acids, amino acids as well as proteins - all substances that are extremely beneficial and used extensively in agriculture. Kelp is also used for culinary purposes and traditionally it has been used in the form of a vital food, particularly when there is a dearth of foodstuff. Some kelp products also contain significant amounts of arsenic, a chemical element that is poisonous. Ingestion of kelp in excess of 2,000 mcg in a day may possibly result in the obstruction of the usual functioning of the thyroid gland and may also cause other different detrimental side effects. In fact, there are many case reports that show that taking kelp in excessive dosage supplies surplus iodine to the body and this too may obstruct the usual functioning of the thyroid glands. Therefore, people suffering from thyroid problems, dermatitis herpetiformis or any different type of thyroid problems ought to consult their physician prior to taking any supplement that encloses kelp. Pregnancy and breast-feeding: The use of kelp directly on the cervix during pregnancy or childbirth is unsafe. Kelp can cause serious side effects for both mother and child, including infection, rupture of the cervix, and infant death. Taking kelp by mouth during pregnancy is also unsafe because kelp can affect hormones. Taking kelp by mouth during breast-feeding is likely unsafe because kelp might contain some poisonous chemicals. If you are pregnant or breast-feeding, it’s best to avoid kelp. Kidney problems: kelp might cause dangerously high potassium and iodine levels. Don’t take kelp if you have kidney problems.